Check out my post a day or two ago. The first photo is of Rita's car Stella, who has eyelashes. Apparently, no one noticed. 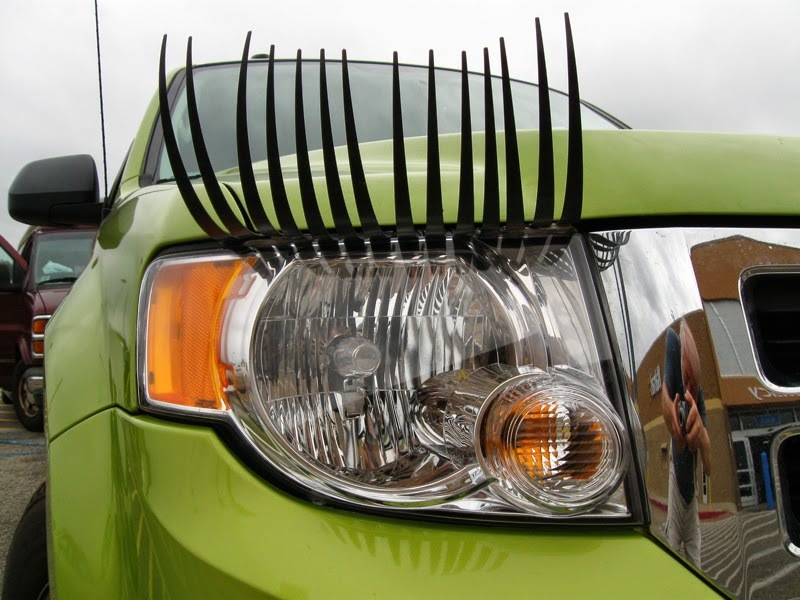 The eyelashes on your green car are huge. This is so totally cool! There must be none around here, because I have never seen one before. Now I want one for our car, she is red, so would be a real siren! i really did laugh out loud when the post opened. this is adorable and Lulu sounds good to me..great shot... and i love it.. my mom would have wanted this car. No matter how long my Mom has been gone, I still miss her too. It will be 19 years this Christmas. I still think when I see something interesting or different, oh I should call Mom and tell her about it. I definitely would have taken that picture too. Lulu is the perfect name Linda. Oh my goodness. I've seen the tiger tails hanging out the backs of car trunks around here, but eyelashes? New one on me. Thanks for sharing--too cool! And funny. Yes, that leaves me grinning too.